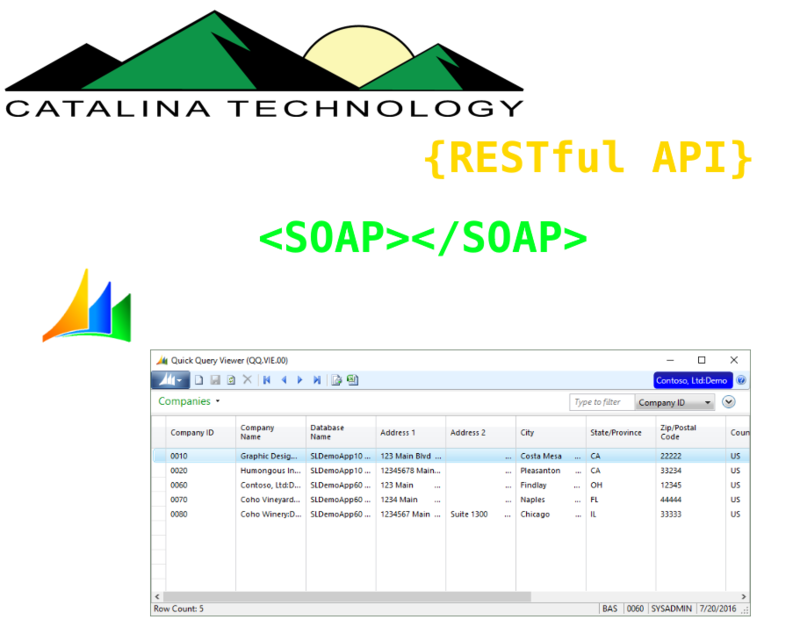 Need an API for Dynamics SL Quick Query? Many use Quick Query for an easy way to retrieve data out of Dynamics SL. Catalina now provides a simple way to utilize your Queries through a RESTful or SOAP based API. Send SMS messages directly from Dynamics SL. When recipients respond, SL is automatically updated. Attachments can even be sent! Replies automatically updates SL. Like change status of a service call, update equipment list, etc. Attachments like photos and gps coordinates can be attached to the SL record automatically. Do you have a CRM, mobile, helpdesk, or other application or system that needs to integrate with Dynamics SL? Catalina's API for Dynamics SL is the answer. Reduce cost, time, and errors by eliminating the need to re-key data between systems or using Transaction Imports (TI). SMS Central for communication between Dynamics SL and your field service and sales. Your field person can respond and automatically update SL with status changes and other information by just replying to the SMS text. 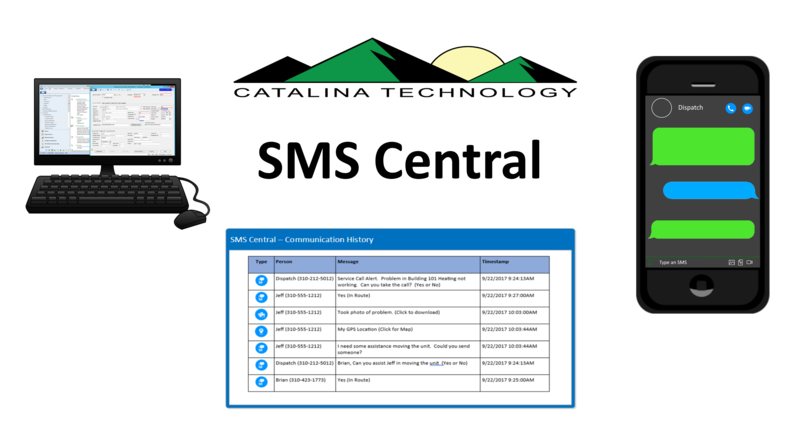 They can even attach photos, GPS coordinates, and other files which will automatically get attached to the record in SL. Order Central™ is a full featured B2B and B2C shopping cart system that integrates, in real-time, to Dynamics SL. There is no need for complicated data batching. Order Central uses Catalina's API integration, to directly connect to SL giving real-time pricing, availability, order creation, order history, and more. Sales Central™ gives your sales and customer support team access to a web based sales order entry screen allowing them to manage orders and customers without terminal server. PC, Mac, iOS, Android, and any other device with a browser can now access Dynamics SL order management. Save time, money, and get paid quicker by allowing your customers to pay their bills online through a secure PCI compliant payment solution. Once the payment is authorized, it is automatically entered into SL's AR module as a payment entry or application. This reduces errors and makes reconciliation a snap since there is no re-entry of data. Do you sell or want to sell your products on the Amazon Marketplace? Catalina's Amazon Connector allows you to sell on Amazon and integrate to Dynamics SL. Maintain a high rating on Amazon and get paid quicker by not having to re-key or use TI for inbound orders and sending shipper notification back to Amazon. Also integrates with fulfill by Amazon. Need to get data to your employees via the web? Report Central™ is a full featured web application for putting your database reports online and a platform for building other web applications via our extensive API. Web-enable database reports — Create the interface to Database reports with an easy to use Admin web interface. Allows pointing at any server, database and stored procedure on your network with securely. Catalog Central™ provides simple content management for websites. Your Catalog Central™ online catalog can deliver high end content management (CMS) capabilities without the complexity, expense, and learning curve typically required. There are some of you that have SL Weborder who want to upgrade to the new version of Dynamics SL. Since SL no longer supports Weborder, we have come up with a solution called OCLite. Whether you are migrating from Weborder or you just want a simpler featured version of OrderCentral, OCLite is the solution to run on SL7/2011/2015 using your existing Dynamics SL business logic and configuration.